How creative, and adorable, is this!?!?!? Such an amazing, repurposed project, Izzy! Cory's teacher will love it! Ohhhhhhhhhhhh this is JUST ADORABLE!!! WOW!!! I loveeeeeeeeee the transformation from heart to bunny!! Toooooo cute!! And loving the card too!! BEAUTIFUL!! 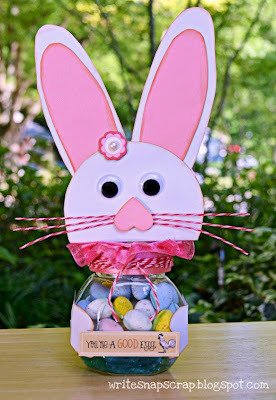 Love the bunny treat jar! I'd love to receive that! :) Cute bunny card too. Can't believe that Easter is so close! Great projects. I am going to have to store up these ideas for when my grandchildren need to make fun gifts. 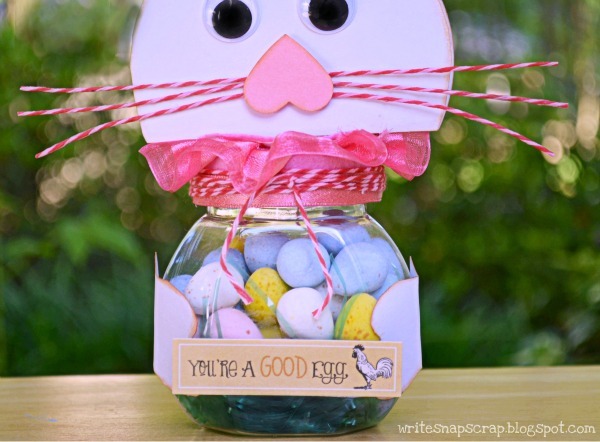 That bunny treat jar is just tooooo cute! Great card too. What die is that bunny from? 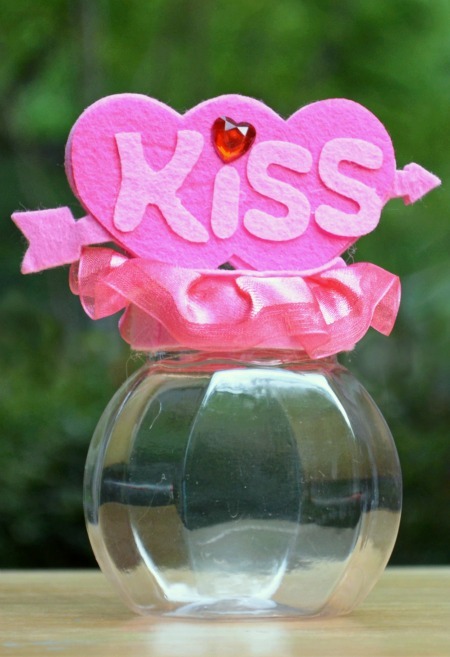 Adorable redo of that jar! LOVE it! Your card is just as CUTE as can be! Super cute! What a great transformation! so cute the candy canister!!! and I love the simple card~adorable style!!! You are so clever! These are both so adorable! You are so crafty, this is too cute! Cute basket! 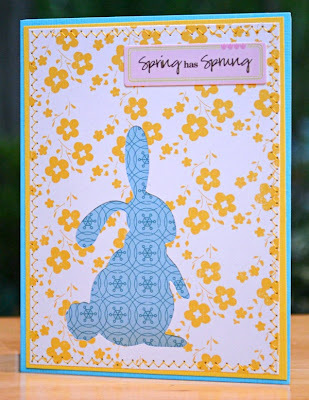 Love the colors on your bunny card! Wow...you did a great job! Izzy, this is so cute! I love this. What a sweet little gift. Thank you so much for using my Cherry Cupcake twine. You rock!! The jar is fun, but I LOVE the negative effect on the card! The jar is so pretty! What a cute card! Hugs! Oh Izzy, that jar is just way too cute!!! Love your card too! I bet that jar was a huge hit with the Teacher and the kids. it's brilliant, I love it!! oopsies.. commented in the wrong spot.. I love how you re-purposed the jar. Totally awesome Izzy! I love the saying "you're a good egg" that you added to the jar. Totally cute! What a cute bunny jar - I'm sure the teacher loved it. Awww this is so ADORABLE!!! You did such a great job with the project and with the super cute card!! Thanks for joining us for this month's Trendy Twine Challenge!